Not cleaned as I don't want to devalue it. Fantastic Pair Of Mid Century Polished Brass ​Medium Sized Model Tiger Sculptures Circa 1960's ​'Sabre Toothed Hunting Stance' These Make For Fantastic Display Pieces, Adorning A Desk, A Mantle, Shelf, Side Table etc.. ​With Intricate Detailing This Pair Are Highly Decorative And A Real Eye Catcher ​At Home In A Mid Century Modern / Hollywood Regency Set Up, But Are Sure To Make For A Nice Feature Wherever They Are Re-Homed. ​Combined Weight: 750g ​Dimensions: Full Length 21cm x full height 8.5cm x Full Width/Depth 5cm ​In Excellent Condition -Please View All Images For A Good Clear Description-. Pair Of Brass Tigers. Dispatched with Royal Mail 2nd Class. Heavy Vintage Brass Tiger. ( see description). This Tiger Has been in my Family for over 60years. 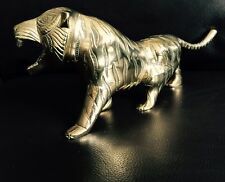 Rare Antique English Art Deco (1930s) Heavy (1.25kg) 12"/30cm Long Polished Brass Tiger Please browse all 12 sets of photographs for size, weight and condition as they are self explanatory. Lovely item. Needs to be seen and handled to be fully appreciated as photographs attached do not do it justice. Absolutely marvellous weight and quality. Beautifully handcrafted. Old antique item with confirmed family provenance dating back to Victorian period. Propeller turn, stand can be removed as can the plaque. This weighs in over 1.5kg as you can see on the scales. are in England and simply by design this plane deserves pride of place on a cabinet or in a display. The inside is engraved "Mod. Made in Italy". This is set #35189. This set is: Tiger I Brass 88mm Projectiles. A large Thai traditional folk lore amulet / shrine / THAI WITCH DOCTOR'S MAGICAL / PROTECTIVE WAND : a gilt brass cast PROTECTIVE WISE TIGER HEADED LERSI FINIAL DESIGNED, CHARM COVERED FIRE WAND. Chinese brass gong bell tiger in forrest theme This is hexagon shaped brass gong bell depicting a tiger in the forrest. Inside is etched Made in China and a name which is not legible. We would date this to around 1950s or 1960s. ​Size is 18cm x 14cm. With chase floral design. In very good condition. 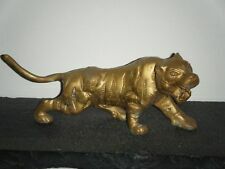 Brass tiger statue in good condition. Old brass trivet as shown. Tiger design. 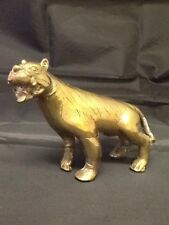 UNUSUAL ANTIQUE BRASS TIGER TRIVET. STANDING ON BALL AND CLAW FEET. WEIGHS: 2.11 KGS. IN VERY GOOD CONDITION FOR ITS AGE. At underneath, Signed REG-D-761497. Little bit un-flat, but surely, when put Heavy stuff on will be ok. Excellent for flowers pots or cook pans. decorative and certainly collectible. Length 26cm x wide 14.3 cm. Perfect gift for a tiger lover ! A great item. • GREAT GIFT ! • used but still in nice condition ! • FOR ANYONE WHO LOVES tigers.